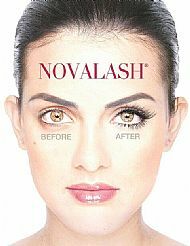 NovaLash eyelash extensions are a glamorous new way to extend the length and thickness of natural eyelashes. NovaLash American Volume extensions create beautiful, full, feathery volume the American way with varying lengths, textures and durability. Multiple extensions are applied to one natural lash to create fuller volume giving a much thicker and darker lash line look. They create a full but natural look. Tapered lashes are bonded to a single natural lash, giving effortless glamour that's difficult to detect even close up.